Tuesday Feb 7 is ‘Make a Call for the Castle Day’. We need you to pick up the phone today, and dial. Opposition to clear-cut logging in southern Alberta’s castle watershed and support for its permanent protection is unprecedented. Alberta Premier Alison Redford and former Premier Ed Stelmach have received 80,000 letters and emails, and hundreds of phone calls from Albertans as well as people from around the world. Despite this and a 3-week long protest at the logging site, road building has begun and logging will commence any day. Now it’s time for Alberta’s legislators (called MLAs) to hear from people who want to see change. On Tuesday February 7, we are asking people across Alberta and all around North America to make phone calls to ask for change. Albertans Click here to find the contact information for your MLA. If you live elsewhere, call the Premier at the number below. 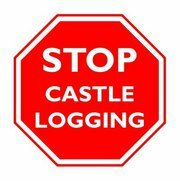 You are opposed to logging in the Castle watershed. You support its permanent protection as a Wildland Provincial Park. If you live in Alberta, please call your MLA first, and then the Premier. You can reach them both through Alberta’s toll-free line at 310-0000. If you live outside of Alberta, call the Premier at 780-427-2251. People have been working to protect the Castle Special Place for more than 30 years. Let your voice be heard! Together we can save this special place. Rallies in support of stopping clear-cut logging in Alberta’s designated protected areas and popular recreation areas, including the Castle and Bragg Creek, will take place at 12:00pm to 1:00pm on Tuesday, February 14. The rallies will be in Calgary at the McDougall Centre (455-6 St. SW), and in Edmonton, at the Provincial Legislature building (10800-97 Ave.). Bring a sign and your passion for protecting Alberta’s wilderness. This entry was posted on Tuesday, February 7th, 2012 at 11:11 am and is filed under Uncategorized. You can follow any responses to this entry through the RSS 2.0 feed. You can leave a response, or trackback from your own site.